I was a super active person until last summer. Between teaching several fitness classes per week, walking a few miles a day (hey, I’m a New Yorker!) and being a Fit Bottomed Girl who co-hosts and produces the Fit Bottomed Girl Podcast, exercise and being active is a big passion in my life. One evening last August, I ordered some tacos for dinner and excitedly headed down the steps (I live on the second floor of a walkup) to greet the delivery guy. At some point, I felt myself spinning in the air and had no control over my body. I landed on the bottom of the stairwell and noticed my right ankle at a weird angle. Long story very short: I wound up in the hospital for five days and had a major surgery. My recovery would take three to six months. I would be completely homebound for several weeks and eventually need months of physical therapy just to get back to walking again. My recovery was steady, but slow. I went from getting around with a walker without putting any weight at all on my right foot, to a walking boot, to my current state of being able to walk, run, kind of jump, and perform really slow burpees. It’s taken months, but every day I feel more like the old me. It also took a team of helpers, because while New York might offer everything I need within a couple of blocks, that did me no good when I wasn’t even allowed to go down the stairs of my building! 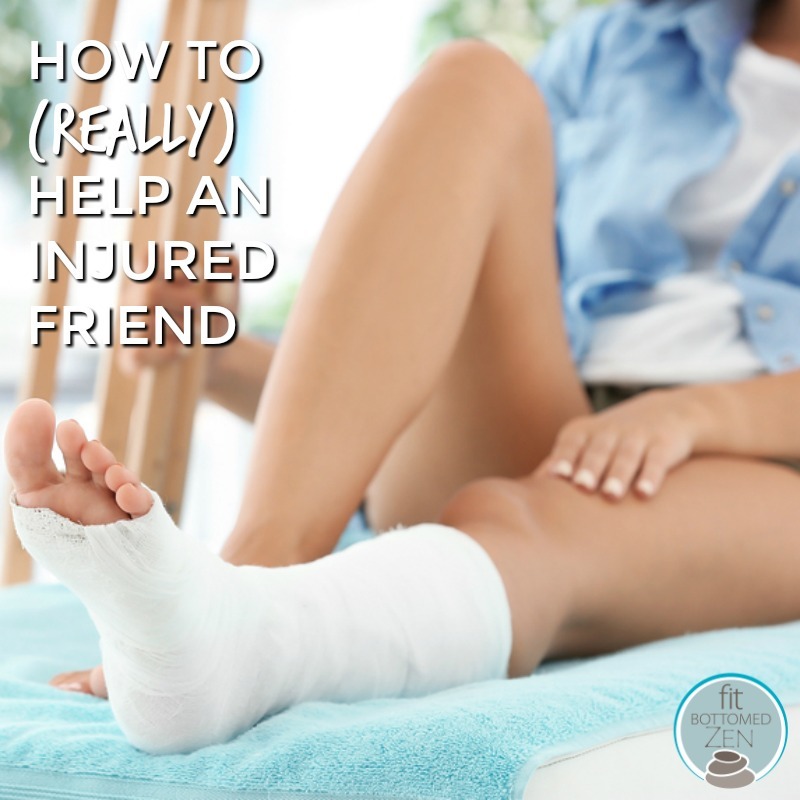 So, based on my experience, here’s my advice to all of the FBGs out there who want to help out a friend or family member who’s sidelined due to illness or injury. Send/give gift cards for Seamless, FoodKick, Instant Cart and GrubHub. Anything that can make shopping for meals and groceries easier will be truly appreciated. I cannot count the number of times these came in handy. Just make sure that, if you buy a gift card for a food delivery service, it’s one that delivers to your friend’s location. Offer to make heatable meals. My friend Barry made a huge pot of chili for me that he put into quart-sized sandwich bags and stored in my freezer. LIFESAVER! Set up play dates or offer to babysit for your friend’s kids. Recovery can be tough on children, too — plus, an injured mama could definitely use a break. Being an awesome babysitter will build your good karma in the future! Offer to drive/accompany to doctor appointments. Medical visits are incredibly nerve-wracking. Having a buddy to help distract and keep you relaxed (and take notes!) is so helpful. Pitch in with the care of their pets. Take their dogs for a walk — or be a superhero and offer to clean the litterbox. Visit just for the sake of visiting. I appreciated when someone came over just to share a meal or watch a movie. It made me feel normal and improved my mood. If you don’t live nearby, try Facetime or Skype — let them see your smiling face! Offer recommendations for entertainment. Offer suggestions for books, movies, podcasts, streaming TV, etc., because we got nothing but time on our hands. Listen to them. Try to be a helpful and hopeful presence in their life by being a source of empathy. If there is one big takeaway here, it’s the importance of understanding the difference between empathy and sympathy — and there’s no better place to learn about this than from Dr. Brene Brown. Sometimes, well-meaning friends can be the opposite of helpful. Here’s how to make sure you are not *that* friend. Don’t ignore their emotional distress. Delicate point here, but if you notice signs of depression/isolation, encourage your friend to speak to a professional. Even those who don’t generally struggle can have a hard time when injured and unable to get out or exercise, and those who typically rely on physical activity to help with their mental health can find this situation incredibly challenging. Don’t forget to check in from time to time. During difficult times, it’s not unusual to not know what to say — so we don’t say anything at all. But don’t do that. Reach out just to say hello, or to say, “I am thinking about you.” Even contacting them to say, “I don’t know what to say,” is better than staying silent. Emails, texts, and messages: All those little interactions add up, so do check in. Don’t make a big deal out of temporary limitations. I was not allowed to put any weight on my foot or get my cast wet, which meant I could not fully bathe or shower for two months. I heard dozens of times, “I could never live like that!” Telling your friend, who has no control over her situation, how awful you think her circumstances are (however temporary they may be)? NOT helpful. Hopefully, you’ll never find yourself in my position, if you do, let me share a couple of lessons I learned. If you need help, ask for it. I will never forget the time my friend Tom came over to take out my garbage and set up my new shower chair (that is a game-changer by the way). I thanked him profusely, and he said, “Margo, you are our friend, and it makes us all feel good to help you.” Your peeps love you. Just let them know what you need! I have the best friends and family in the world! They visited me in the hospital, brought me my mail, deposited checks, gifted me with a Roomba (! ), washed my hair in the kitchen sink, dropped off leftovers, did my laundry, sent me books and helped me heal, all with humor and loyalty that I am not sure I deserve but am eternally grateful for every single day. * Just say “yes” to staying overnight in the hospital, if the doctor recommends it and your insurance allows it. When the doc asked me what I wanted to do, I was tempted to say I wanted to go home, of course. They told me something like 50% of patients with that surgery end up in ER the same day due to “pain maintenance issues”. I wouldn’t have made it through the night without the IV drugs. * Post-op housing – A friend had me stay at hers for two nights after surgery. Most people would want to go home, but her place was close to the hospital and it allowed me to sleep while she carried on with her life so I didn’t have to feel like I was entertaining her. Plus, she knew her own kitchen so could cook for me without me having to get up and show her where things are. * Don’t try to work when you’re on painkillers. Enough said on that! Very nice article and useful tips to help the others! Thank you for your efforts! Thank you for all of the comments, everyone! I appreciate you taking the time to read it.